Thank you for purchasing Hide My WP. ! I can't login, what should I do now? Does it works with Nginx ? Why my settings page is different with official screenshots? This plugin break my other plugins. What should I do? I change the plugin and it make my site ugly! Why? With Hide My WP nobody can know you use WordPress! This not only greatly increases your security against hackers, bad written plugins, robots, spammers, etc. but it also allows you to have more beautiful URLs and better control over WordPress. Recommended: .htaccess file with writable permission (need mod_rewrite module for Apache) or Nginx with access to configuration file. If you extract downloaded ZIP file you should have this file structure. Main folder includes four subfolders and a PHP file. CSS folder includes one stylesheet (admin.css). It used for backend appearance. Documentation contains this document and its related files. img folder contains three icons with different sizes. These icons don't be used currently. lib contains PHP files and a folder called 'mute-sceamer' used for IDS (since v4). class.settings-api help us to create our settings page base on WordPress settings API. class.HTML-minify.php We use it for safe HTML compress. class.CSS-minify used for safe CSS compress. hide_my_wp.php contains main plugin class. Almost everything will be done here. Automatic installation is the easiest option as WordPress handles the file transfers itself and you don’t even need to leave your web browser. To do an automatic install of Hide My WP, log in to your WordPress admin panel, navigate to the Plugins menu and click Add New. Click Upload and choose plugin zip file from your computer then click Install Now and enjoy. The manual installation method involves downloading our plugin and uploading it to your webserver via your favorite FTP application. To use all of Hide My WP features you need to have a writable htaccess file and enable permalink structure. In most cases you have passed this level before but if your post URLs ends with ?p= or you have problem with changing theme or plugins URL continue reading. To enable Permalink Structure go to admin panel and choose Permalink from Settings menu then choose one of pre-defined options and save your changes. Nginx is an open source web server (like Apache). If you can't find any htaccess file in your server or there is a /index.php/ before your WP permalinks this (usually) means your server uses Nginx. As there is no htaccess or automatic configuration for Nginx you need to configure it manually. To do that you need root access and basic SSH knowledge. Now you need to add those lines to your Nginx configuration file. It usually located in /etc/nginx/nginx.conf or /etc/nginx/conf/nginx.conf. Don't simply add rules to the beggining or the end of file. Make sure they are in server block. Hide My WP is compatible with network enabled WordPress. This means only site admin can change settings but those settings will apply for entire network. To make HMW work with your multi-site installation you need to edit your htaccess file manually. To do that go to plugin page (Network admin panel -> Settings) and click on multi-site configuration button in start tab to see htaccess rewrite rules. Simply go to Plugins page in admin panel and deactivate and delete the plugin. This will remove your settings and now you can install new version. If you would like to store current settings do not deactivate it and just replace files. Hide My WP provides lots of cool features and all are well-organized, self-explaining and easy to use. If you finished installation you should go to the plugin settings page and configure it. To do that navigate to the Settings menu and click Hide My WP. This is our settings page. In start tab you can import and export settings or simply use a pre-made settings scheme. There is also a debug report generator used when you need help. You should provide it to our support team. General Settings tab includes a number of general options about the plugin and WordPress. For example what page should be displayed as custom 404 page or which users should be assumed as trusted. You can also hide some aspects of WordPress. For example you can hide wp-admin folder or remove WordPress generated codes from source code there. One of the most characteristic aspects of WordPress is its URLs. Our third tab includes a number of settings allows you to disable or change these URLs. For example you can change path of your theme or disable WP feeds entirely. You can review our features list for detailed information but as a start let's change your feed URL. First check your feed address in your home page it should be something like http://yourdomain.com/feed/. Now Go to Permalinks & URLs tab and scroll down to find Feed section. Enter something as Feed Base (e.g. rss) and click Save Settings. Check out your feed address again and booom!! it was changed. Now enter old URL in your browser and press enter. Oops! It can't be found! Both feed base and feed query work similarly. Please note when permalink structure is enabled queries won't be used by WordPress itself but when someone type them in address bar they will work. This is a simple way to discover whether a site using WordPress or not so we always recommend changing queries, too. High Privacy will enable almost all of Hide My WP features and bring maximum security and privacy but you may experience some incompatibilities with other plugins. If you don't have lots of heavy plugins feel free to use this option. Medium Privacy (Quick) is a general use settings and balance between security and compatibility. If you don't use a cache system we recommend using this scheme. Medium Privacy (More Compatibilty) is another general use scheme and everyone can use it. It focused on compatibility so it's slower than others. If you experienced problem with other plugins or you have a good hosting (or a cache plugin!) use this template. Please note in most cases incompatibility caused by one feature and you can just disable it. After choosing your appropriate settings scheme click Save Settings to implement changes. If you do this it will warn you against login address change. Click OK and finish importing. 1234 is default admin key. It's possible to change it to anything else within 'General Settings' tab. Admin key allows Hide My WP know you are a trusted user. In fact it is not a real password and you can securely give it to anyone who needs to login (e.g. members, editors, etc.) but it doesn't mean you can share it public! If you have a membership site with lots of members you may prefer to install Theme My Login (instead email new address to all members). This plugin is free and doesn't need any key. Hide My WP includes lot of different options. Let's review some of them. When a user requests your hided files Hide My WP displays 404 page instead. You can use default 404 page from your current theme or make new page in your WordPress admin and use it as 404. Custom page allows you to have a cool and creative not found page. If you hide wp-admin folder other members can't see WordPress admin (even if they logged in successfully). You should choose their roles here to allow them to use admin panel. Administrators (like you) always are trusted! Hide My WP automatically replace old URLs with new addresses. If you use a shared hosting or have not any cache plugin this may make your site a little slow. Here you have two choices: Partial mode and Full Page mode. First only replace URLs when needed but second scan all the output. In most cases Quick mode is enough and work correctly but if you use a plugin that generate old URLs Full Page mode may help. If you use a caching plugin (even with minimum configuration) you can freely ignore all quick modes. One of the easiest way to know whether a site using WordPress or not is adding wp-login.php to its site URL. Hide My WP will hide login address so no one can know you use WordPress. But there is a problem. If you hide your login page how can you login? We solve this issue with admin key. Admin key allows the plugin know you are a trusted user. You can change admin key to anything. If you enabled this option and still see wp-login page see this answer! Another common way to know whether a site using WordPress or not is checking wp-admin folder you can hide it here. Trusted users still can access to admin panel without using admin key. If you enable this option an email will be send to you whenever someone visit 404 page. This email includes some details about URL and user so you can find broken links and user who is researching about your site. Please note if you have a high traffic website a broken link may send lots of emails. If you check your site's source code you see some additional meta headers generated by WordPress. These metas includes feed URL for that specific page, previous and next posts, short links, Windows Live Writer tags, etc. Most of them used rarely and you can clean all of them by this option. WordPress adds lots of CSS classes to some elements in your code. For example this is a body class: "home blog logged-in admin-bar no-customize-support". These classes let you change your theme using pure CSS and are useful when you have not access to PHP files (e.g. wordpress.com blogs). You usually don't use these classes but stick in your mind that some plugins and themes may use them for better appearance (e.g. Woo Commerce). We do not remove popular classes (like active menus classes). Your feed always displays blog tagline (even if your theme doesn't). So if you don't change default tagline you can hide it using this option. There are always some html comments in your source code that can indicate you are using WordPress. This option not only remove these comments but it also compress your page and make it faster to load (and harder to read!). You can use Quick or Safe mode. First is faster but may have problem with non-standard pages. Safe is more compatibile but slower. I recommend to use this option (specially Safe mode) with a cache plugin. Also note this option won't remove any IE specific comments (e.g. [if IE 8]). This is an important feature and block direct access to all PHP files. This option greatly increase security but you should use it carefully. Some plugins need direct access php files (e.g. for importing feeds there is an import.php or for AJAX operations an ajax.php). To make these plugins work you need to know these files and add their path to except list. Please note index.php, and other files used by WP are in except list by default. 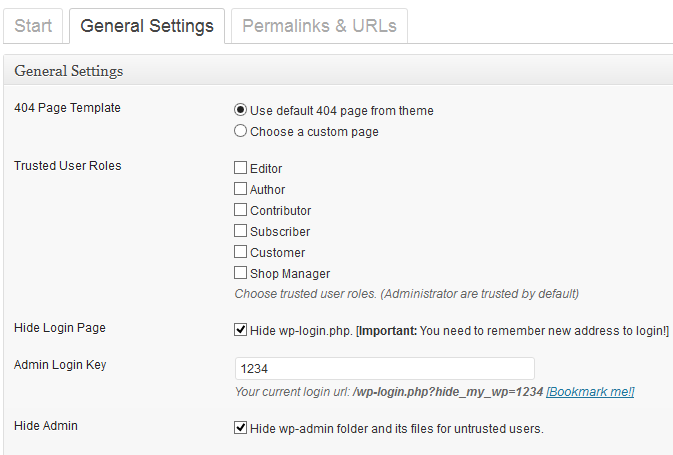 wp-login.php and wp-admin folder will be controlled by their own options. There is also two options that helps you to use this feature without compatibility issues (exclude theme files and exclude plugins files). There are also some other WP files that are not PHP but can be used to indicate whether it's a WordPress site or not. This option will hide them. If you enabled permalink structure WordPress redirects old queries URLs (like ?p=2) to new one. If you want to use queries URLs you should enable this option. Default sender address is wordpress@domain.com. You can change it to info@yourdomain.com, no-reply@domain.com or something similar. This is one of the most useful features in Hide My WP. There are some plugins that print credit link or additional data in your theme. You can replace or delete these words using this option. Just open your source code select and copy the text and replace it with something new. For example 'old=new' will replace all 'old' words with 'new'. Similarly, 'old=' will delete 'old' from your source code. Please note words in your posts will be change, too. Here you can change your theme URL. All files and folders in your source code will be replace with new address for example /wp-content/themes/style.css will be replace with /template/style.css or wp-content/themes/twentytwelve/images/png/logo.png will be change to /template/images/png/logo.png. You can also use nested folders like test/static/skins/. Please note it's NOT possible to use plugins or wp-include pathes as a base folder for this field. In addition to theme path you can change style URL. You can use theme path or enter a new for style. For example if theme path is /template you can just rename style to main.css: /template/main.css or use a different url for style.css: /styles/css/main.css. Although there is no limit for file name and you can use any extension or no extension (e.g. /path/style.php or /style/) but we recommend to don't be creative here. This option depends on New style path. If you change style path you can also minify its content. Almost all of style.css files have some information about the theme and its author. This information are available public and anybody can easily know this is a WordPress theme. This option not only removes this information but it also delete whitespaces and other CSS comments so your site will be a little faster. Some plugins come with CSS and JS files. These files located in plugins folder so anybody can recognize this is a WordPress installation. This option helps you change wp-content/plugins/ path to something cleaner. It's also possible to use theme path as a base for this folder. For example if your new theme path is /template you can use template/ext/ here. Even when you change plugins path it's still possible for others to know which plugins are active in your site. Checking this option will replace all path like /wp-content/plugins/woo-commerce/ with /modules/2hg1t7. Just like new theme and plugins path this option will change /wp-content/uploads/ to something else. Please note this option is totally diffrent from WordPress change upload directory located in Settings->Media. As opposed to upload path in WordPress this option won't change physical location. If you check your post source code you will see WordPress uses wp_comments_post.php to receive comments from visitors. Hide My WP let you change this file. user_commernts.php, /folder/comment.php and even /comment/ are all valid inputs for this field. In some cases this option may even work as an effective anti-spam technique. Almost all of AJAX operations both in frontend and backend of WordPress handle by wp-admin/admin_ajax.php. You can change this path to anything else. Just like above ajax.php, /folder/my_ajax.php and even /ajax/ are all valid inputs. 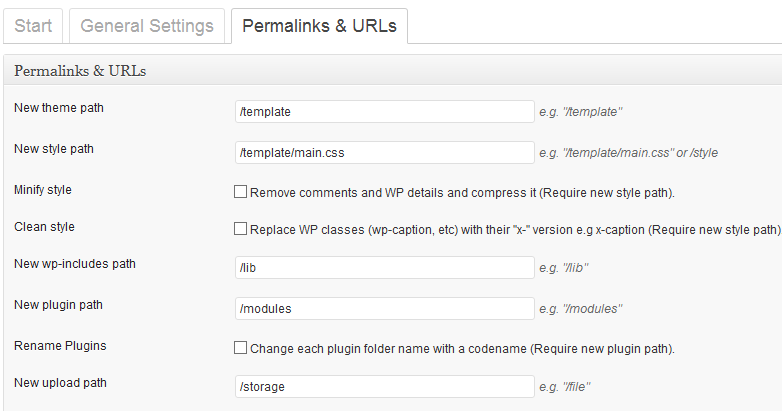 Here you can disable, enable or change WordPress permalinks. Please note when permalink structure is enabled URL queries won't be used by WordPress itself but when you type them in address bar they will work. This is another way to know whether a site using WordPress or not so we always recommend changing queries, too. Here you can disable or enable authors links. You can also change authors URL structure here just enter something as Author Base and you see your authors links change to domain.com/something/username. Nested folders are also possible (something/somethingelse/username). Author Queries is changeable, too. If you want links like domain.com/?user=1, enter 'user' as author query. WordPress uses empty Page Base by default (domain.com/sample-page) when you enable this option it's hard for it to know which URL refer to an author and which one belongs to a page. Thus if you want this option you should enter something as Page Base (e.g.domain.com/base/sample-page). For the same reason, you can't use %post_name% or %postid% alone as Post Permalink. You should add something before or after to make them work. For example both '/archive/%postid%' or '/%year/%post_name%' are acceptable. In this case you may need to change your feedburner address or notify your old subscribers. Here you can overwrite WordPress permalink structure and change the famous '/?p=123' URLs. If you disable post URLs no one can see a single post and therefore no one can comment but archive pages and blog pages may still display posts. Please note if you use author without base feature you should not use %post_name% or %postid% alone as Post Permalink. Add something before or after to make them work. For example both '/archive/%postid%' or '/%year/%post_name%' are acceptable. Just like others, pages can be disabled here. It is notable WordPress don't use any base for pages by default. If you enter something as Page Base then links like /sample-page will be changed to /your-base/sample-page. This may not be so great but if you enable author without base it's require to add something as Page Base. Please note 'Page Base' and 'Paginate Base' should have two different values. When you have lots of posts WordPress needs to paginate them. You see links like Older Entries or Next Posts in front page, categories pages, archive pages, etc. It's possible to disable or change these URLs here but note Page and Paginate should have two different values for both base and query. Just like above you can disable or change these URLs. Category and tag bases will be overwrite WordPress permalink option. Search base will be used when you enable 'Search base redirect' option. When user hit search button and this option has been checked, he/she will be redirected to /search-base/keyword. This is prettier than default search query (/?s=keyword) and we recommend to use it. Unless other components you can't change archive URLs in Hide My WP but it's still possible to disable them. This option will disable daily, monthly, yearly, hourly pages. It doesn't affect categories, tags and taxonomies. 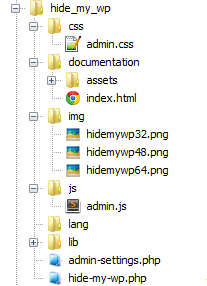 There is still some more components you can disable with Hide My WP. Things like attachments, post types, taxonomies and comment pages can be disable here. It's important to know most of themes and plugins use post types and taxonomies for different purposes. Choosing this option make them unusable. In most cases you don't need this feature. As we said because of the nature of WordPress 100% compatibility is not always accessible. But in most cases it's easy to use all plugins together with some changes in configurations. Make sure you have a writable htaccess file (if you use Apache) or configured your web server manually (if you use Nginx or enabled multi-site). This is a must. Follow installation guide for more details. Disable features that have an asterisk(*) in their names or use a more compatible settings scheme. If you see some plugins related info in source code use Replace in HTML feature to remove them. If you get 404 page make sure you didn't disable or hide require WP component before! If you still have problem and you are sure it caused by HMW please provide debug report or login details (if possible) via a message (and not comment!) from author profile page in Codecanyon. Nginx support has been added since version 1.5. You need root access to configure Nginx manually. Follow installation guide for more details. It's because you don't enable WordPress permalink structure or your host doesn't support rewrite URLs (specifically .htaccess file and mod_rewrite). Also note that screenshots may come from old versions. = I hide both wp-login and wp-admin but I still can see them. Why? Because you are a logged in administrator! Log out and try again. Don't forget to save new login address somewhere. As you may know, Hide My WP does not change any default WordPress location. It uses best practices to maximize compatibility with others but because of the nature of WordPress this is not always accessible. Also, some programmers are not enough experienced with WordPress or simply choose the easiest way. This may cause some little problems. You can still use both plugins follow our Quick Fix Guide. When the plugin deactivated suddenly by WP you should flush rewrite rules. Just go to admin panel and visit "Settings->Permalink". That's it and everything should work now! Multisite support has been added to version 1.5. You need to configure your htaccess file manually. Follow installation guide for more details. FIX: wp-login and wp-admin redirects when new admin path was set. NEW: Undo previous settings whenever you want! New Feature: Login parameter 'hide_my_wp' is now changeable! Performance: Up to 3 times faster with new partial replace mode! Once again, thank you so much for purchasing this item. As I said at the beginning, I'd be glad to help you if you have any questions relating to this plugin. No guarantees, but I'll do my best to assist. If you have a more general question relating to the themes on ThemeForest or plugins on CodeCanyon you might consider visiting the forums and asking your question in the "Item Discussion" section.